It’s breast cancer awareness month. I have so many feelings surrounding this month. I am working on finding a way to put it into words that are unique. Or not. So many of you have written so eloquently about your thoughts and I share those thoughts. Many of you will remember that last month (or was it two months ago? ), the Komen foundation posted an advertisement on national dog day of dogs in bras with balloons for breasts. This was their way of spreading awareness. Some people found this to be cute and funny. Others, like myself, found it trite and offensive. Some people feel like we have done enough awareness. We are as aware as we can be and we should spend all of the funding on research. I will agree and disagree with this. I think WAY MORE money needs to go toward breast cancer research but I also think awareness is important. We have all seen the statistics. Those are fine. 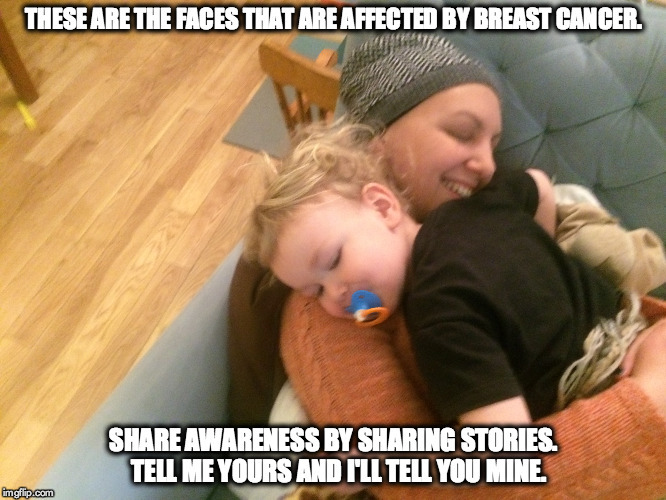 But I think the best awareness comes from story and seeing the faces affected by breast cancer (or any cancer, for that matter). When I think of how breast cancer has affected me, I think of the toll it has taken on me as a mother and the time it took away from raising my son. While I am early stage, I remember every day that this can be temporary and that recurrence is possible at any moment. I’m constantly in fear of leaving my son without a mother. The thought is unbearable to me. It is always on my mind. If I were to share anything about my experience with others is would be that breast cancer is not an older woman’s disease. It can happen to young women as well. That is why it is important for women to know their bodies and do self examinations. If I didn’t do this and my cancer was caught later, I think my prognosis would be much different. If you are willing and able, I’d love to collect and share pictures and stories of women and men affected by breast cancer during this month. As an actor, arts educator and facilitator, I believe in the power of story to unite a community. So let’s share who we are and how breast cancer has affect us and our loved ones. To me, this is the best awareness we can give. Categories: Uncategorized | Tags: breast cancer, breast cancer awareness, breast cancer awareness month, faces of breast cancer, pinktober, sharing stories | Permalink. Carrie, I agree awareness is still important, especially among younger people because we are no longer the rare cases. 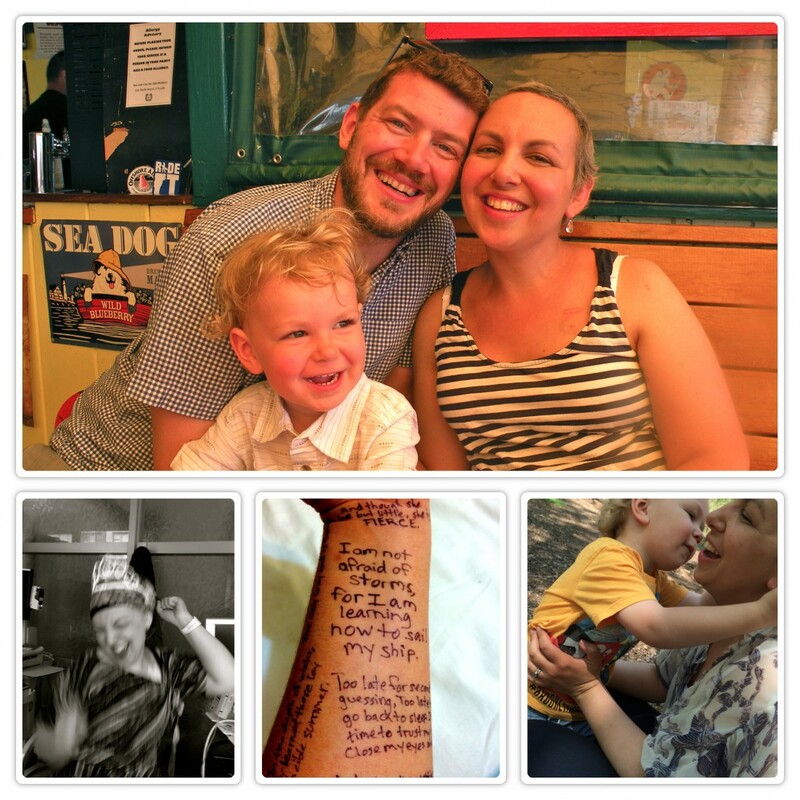 I wrote about “what led me to my cancer diagnosis” and one day I’ll share. For me, “awareness” wasn’t as convincing. It took some strange experiences I had to get me to suspect something was wrong. One of those experiences was a bald young woman who stared at me inside a train as she was exiting – she even stopped to look at me! (“WTF,” I thought.) Denial is super strong, and many times, even with a family cancer history, we doubt it could happen to us. I still think most of the money should be spent on research and not on awareness — specifically in countries where the resources are. However, I feel differently about third-world countries, like mine, the DR. There is a bigger problem in those countries, particularly with their culture. There’s still a lot of ignorance about cancer everywhere, but not like in those poor countries, where more awareness is needed, in addition to medical care. Here’s my story: I was diagnosed with bc at the age of 32. I recently discovered I have a mutated gene called ATM that could have contributed to my cancer diagnosis but only less than 10% of breast cancer cases like mine exist — 85% of bc cases have no family history (“American Cancer Society” data). I contacted my GYN right away when I felt my lump, and in a few days I was getting a sonogram, which then led to a biopsy. A day after my biopsy I found out I had breast cancer. My doctors, despite my family history of breast and ovarian cancers, never thought I would have cancer at such a young age. My only advise is to always listen to your instincts and never delay a check-up. If you feel/see something, have it checked. If your doctor wants to “wait and see because you’re too young to get cancer” run to another doctor! Breast cancer doesn’t discriminate and it doesn’t wait. Ah, and one more thing! I had to point to where the tumor was because doctors were having a hard time feeling it. This mean only YOU know your body best. This also means you have to check 10 days after the first day of your menstrual period as the breast is less dense (this can affect tests results as well). Only you will notice the changes in your body so be sure to do self-examinations. How do we get our story to you? Would you feel comfortable leaving it in the reply section here? Would you prefer sending it to me so that you are anonymous through email? Also, for complete transparency, I have always hoped that my blog would be a place to share stories and build community. That is why I suggest you leave it in the comments section. But, of course, there is no pressure to do that. I have added a contact info page with an email address so you can share a picture and story! Hi, I would love it if you could share your story with me in the comment section. Can you leave photos? If not, I’d be happy to share my email address with you. I have added a contact info page with an email address so you can share a picture! I felt a lump in my left breast last October 2014. I wasn’t doing an exam, simply reading in bed with my hand resting on the top of my chest. Though I said to my husband, “Do you think I have breast cancer?” I didn’t really think I did. I was 39 years old and healthy with no family history, how could I have breast cancer? I made an appointment to get it checked out, and the RN who gave me the physical exam said she didn’t think it was cancer, but she ordered a mammogram and ultrasound just in case. I went to these appointments like nuisances I had to squeeze into my day and cross off my list– because again, I didn’t think I really had cancer. But when the radiologist came into the room after looking at my images, she said she was concerned and wanted me to have a triple biopsy. I was supposed to leave in just a few hours for a week-long road trip with my dearest friends, something I had been planning for a year to celebrate my 40th birthday. My father flew across the country to take care of my kids while I was away, since my husband was in an intensive grad school program and rarely around. When I asked if I could still go on the trip, the radiologist said it was “probably” okay. Probably?! I decided to go, for which I am eternally grateful because 1) I had the most magnificent time, and I really needed that considering what came next and 2) when I spoke with the breast specialist from the road, she said it was good that I was going, because one more week wasn’t going to make a difference, even in the worst-case-scenario. The day after I returned from my trip, I had a triple biopsy. Two days later I got the call that they found cancer in two of the sites and “pre-cancer” in one of them. I was 39 years old with a 6 year old daughter and 8 year old son I feared I would never see grow up. The next blow came 2 days later when I was told I needed a left mastectomy. But my biggest fear didn’t come to be– after the flurry of appointments, I was told that my prognosis was good and that the doctors expected a full recovery. After 5 months of chemo, a left mastectomy with implant reconstruction, and 6 weeks of radiation, I finished treatment this August 2015– though I then had an unexpected surgery last month because of a seroma in my radiated breast; and this past week, I developed another, so I need yet another surgery this coming week. Ugh. It feels at the moment like I may never get back to my life as a healthy, non-cancer patient. My worst fear is metastasis, of course; and I am trying to focus on the fact that I am lucky to have had a curable cancer that seems to have been effectively treated. But I am also feeling the physical and emotional weight of what has now been a year of treatments with what feels like no clear end in sight. Carrie-you asked for pictures and I’m not sure of the best way to send them, as I don’t know how to attach them in a comment. I did write about my diagnosis and treatment in more depth on my own blog, and I included several pictures there (see link below). Let me know if you would like me to email anything to you. Thank you for gathering our stories.